This short by Georges Méliès is one of the longest things he did in 1901 and also one of the most serious subjects he handled. The story of a man who routinely murders his wives is a classic part of the horror genre, and fits neatly into my October exploration of its history. 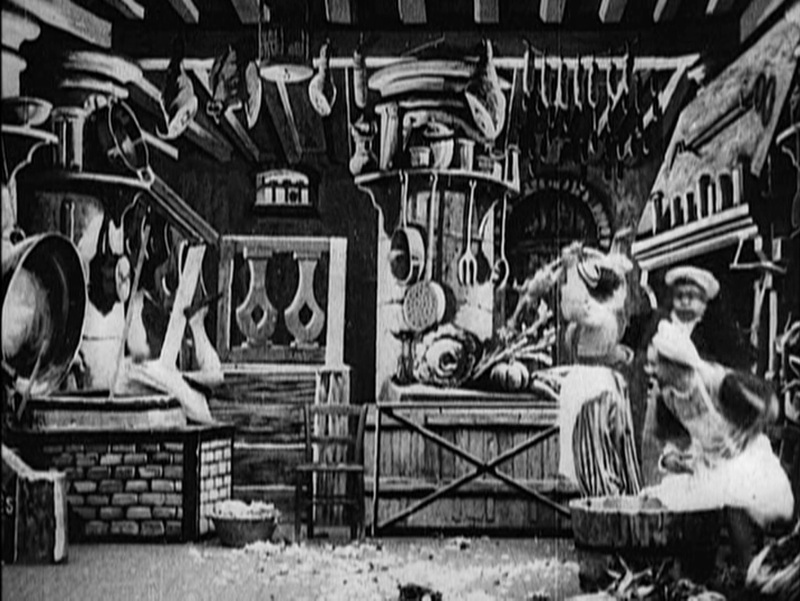 By this point in time, Méliès and other filmmakers were beginning to stitch separate scenes together to create longer narratives. Méliès had already done something like this when he created the reenactment of “The Dreyfus Affair” in a series of single-scenes. However, those movies were sold separately, while this is billed as a single item in the Star Films Catalog, meaning that it would have been sold to exhibitors already edited together in sequence. The movie begins with the “Betrothal of Bluebeard,” which shows a group of nobles in a set built to resemble a palace. There are many young women present. 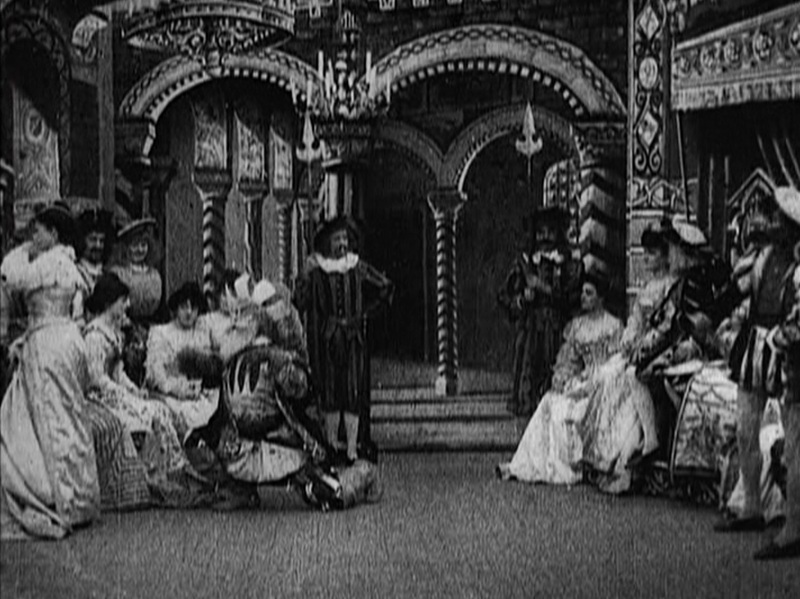 Suddenly, a man with a large beard and a haughty manner (Georges Méliès) appears, but the women reject him when he kneels before each in turn. He then has servants bring out cardboard props representing large sums of money, but this does nothing to change the women’s minds. They are more impressed when he displays a necklace, and the father of one of the ladies forces her to accept, although she (Jeanne d’Alcy) shows obvious reluctance. The next scene is “Preparing the Wedding Feast.” We see the marriage party cross through a kitchen set, at which many cooks are hard at work. There is a procession of cardboard cut-out props showing elaborately prepared boars, steaks, desserts, etc. At the end, one of the cooks is bumped and falls into the stew pot. Another cook tries to fish him out, but only pulls out his clothes. Then there is a brief “Wedding Feast” scene at which the nobles sit down and eat in celebration in a sumptuous dining hall. It is not clear whether they are served the stew with the dissolved cook in it. Next is the scene “Bluebeard departs on a journey.” Bluebeard displays the keys to his castle to his new bride and gestures that she is free to go to any room she likes. Then, he produces a large key separate from the set, and indicates the one door we can see on the castle set. He forbids her to enter this room, and gives her the key, perhaps as a test of her honor. Once Bluebeard leaves, the young woman shows an interest in entering the forbidden room, but she resists. 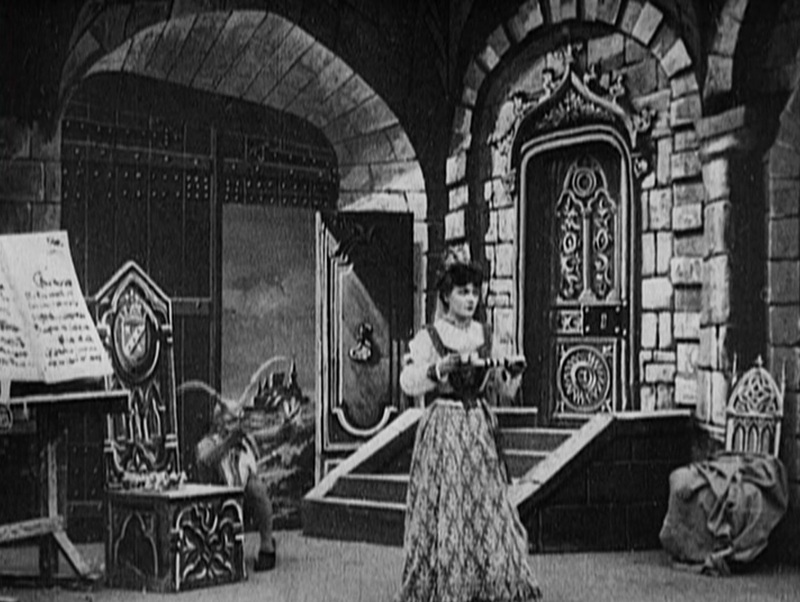 Then an imp or devil appears (I believe that this is also Méliès in costume), and entices her until she opens the door. The next scene takes place in the “Forbidden Chamber.” At first, the room is gloomy and dungeon-like, and there are seven sack-like objects dimly visible in the background. 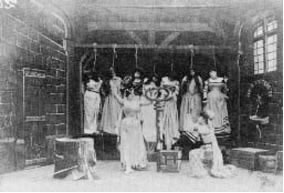 The bride crosses the room and opens the window, revealing the corpses of Bluebeard’s previous seven wives, all hanging from ropes at the back of the room. The bride is shocked, and drops the key on the floor. The key grows to tremendous proportions, apparently to show us that it is now stained with blood, and when it returns to normal size, the bride attempts to clean it off. The imp dances about in this scene as well. The next scene is titled “A Troubled Dream,” and it shows the bride lying in her bed while visions dance above her as in-camera effects. She awakes upon having a vision of Bluebeard impaling her with a sword. 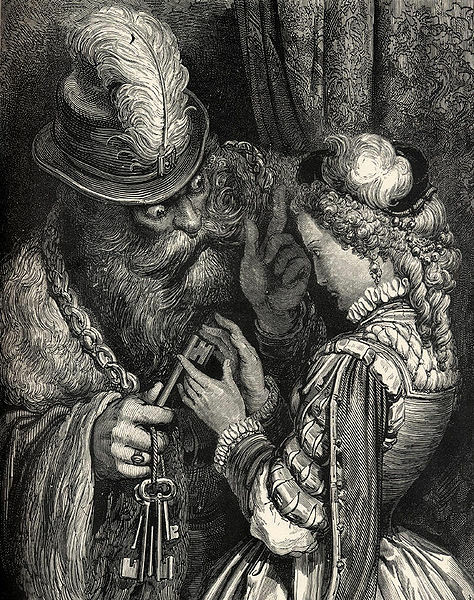 In “Bluebeard’s Discovery and Condemnation,” the bride is caught when Bluebeard returns home and sees the blood on the key, and he flies into a rage. This scene is staged on a courtyard set, the only set used twice in this movie. The bride flees stage right into a tower door. Bluebeard pursues her and we see the top of the tower as a set for “Looking in the Tower for Fatima.” There is another woman present (possibly intended to represent a Guardian Angel). Bluebeard seizes his wife and drags her back downstairs. The scene “At the Place of Execution” takes place back in the courtyard, as does the scene “Arrival of the Deliverers,” making them appear to be a single scene with two parts (and then a third): at first, Bluebeard threatens and rages at his bride, and then, just as he is about to slay her, a group of noblemen break through the gate (actually, it looks like paper) and fight Bluebeard, finally running him through with a sword and pinning him to the wall. He continues to struggle while they reassure the bride and the imp reappears to dance around the stage. Then the sword is removed, cuing the “Death of Bluebeard,” in which he tries to rise and fight again, but finally falls to the ground. Then, there is a short “Apotheosis: The Eight Wives over Bluebeard’s Body.,” in which we see the women in a happy afterlife, with Bluebeard sprawled before them. Bluebeard is a traditional figure in French folk tales, and there were several operas written about him in the 19th and early 20th centuries. This doesn’t seem to draw on any of them, however, although it probably draws on a 1697 story version written by Charles Perrault. Audiences in 1901 (especially in France) would be familiar enough with the story that it was possible to make this movie with no Intertitles, although in fact it was probably accompanied by live narration, at least when shown at the Robert Houdin Theater. I have had to fill in some details from reading about the narrative – it didn’t all make sense to me when I watched it cold. 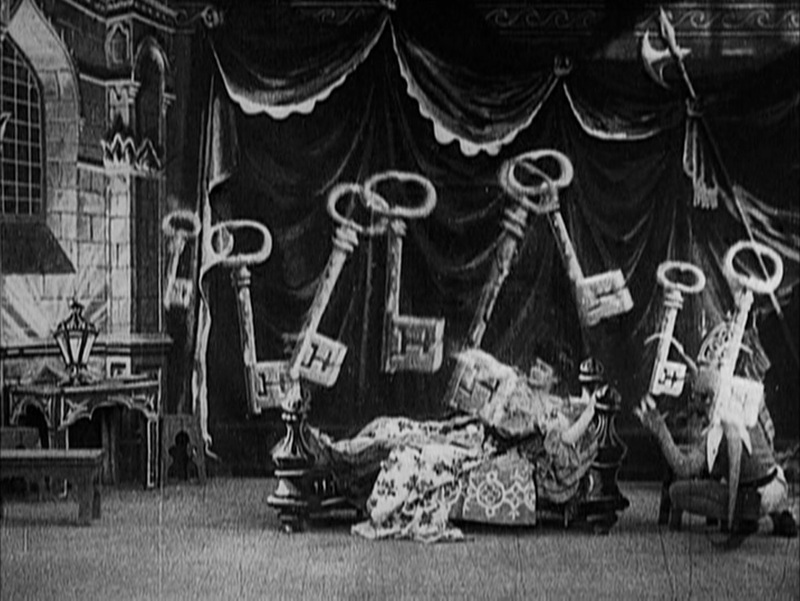 In particular, I didn’t understand the part about the expanding key, which I think Méliès was using as a kind of close-up, to make sure we saw the key and what had happened to it, but to a modern viewer it just looks like an anomalous magic trick. It’s also strange that the catalog breaks a single scene in the courtyard into three separate titles. At any rate, this is quite possibly the most genuinely horrific work we’ve seen from Méliès, even granting that it retains his sense of playfulness (especially in the character of the imp) and fantasy. The implications of the story are quite grim, and even the bit with the cook dissolving into the stew works as sort of a black comedy joke, establishing the low value of human life in Bluebeard’s castle. Bluebeard writhing on the sword is also fairly grotesque for the time. This is also the most complex movie I’ve seen from Méliès at this early date, although we are just one year away from his masterpiece “A Trip to the Moon.” That movie is just a little over two minutes longer than this one, but involved more elaborate sets and special effects, and a somewhat larger cast as well. You can watch it for free: here. My question has nothing to do with your review, but did you see “Hugeo” (2011)? If so, what is your opinion? Ack! I meant to type “Hugo”. Doh! Anyway, I need to see it again, now that I’ve been working on this project for a while. I remember liking it, but it might read differently now.